William Joyce is a creative tour de force. He's the award-winning brain behind The Fantastic Flying Books of Mr Morris Lessmore, the author of over 50 children's books, and the conceptual creator of the characters in Toy Story and A Bug's Life. And that's just scratching the surface of his achievements. By anyone's reckoning, he's a success in his chosen field. But who would ever have thought that his creative journey could have begun with a booger? This is part picture book, part memoir. It's 'written' by 'William', the adult, but also by 'Billy', the little boy William once was. Like many creative types, Billy wasn't a natural fit at school. His attempts to decorate his maths homework with doodles weren't appreciated. He wasn't good at sport. And the teachers often sent notes home to his parents complaining about the 'mayhem' he created. Even the principal described him as his 'most challenging student'. Fortunately, the school also recognised his creative talents and so when a contest was announced to see which kid could create the best kids' book, Billy was encouraged to enter. He worked hard, he did the research, he wrote and drew for days, until finally he produced Billy's Booger: The memoir of a little green nose buddy. It was brilliant! Or at least so Billy thought. But the principal didn't agree. Billy didn't win. He didn't even place. What Billy did discover, however, was that his book was the most popular with the kids — the audience that truly mattered! And that was the start of Billy's journey to becoming Emmy and Academy Award-winning William. 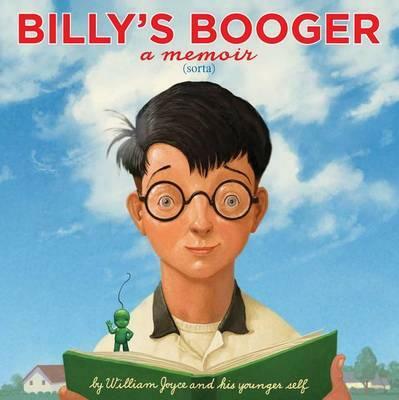 This book is both of the story of Billy's childhood — complete with flashbacks to a time when TV was only in black and white — and the story of Billy's Booger. His original book has been reproduced as a sewn-in mini-book, with all its horrendous spelling, inventive punctuation and erratic grammar. The end result is as creative as William Joyce himself, and a lot of fun! I'd love to see every library and school have a copy of this book, to encourage creative kids just like Billy to follow their dreams and stay true to themselves. I'd also love every school to run a competition just like the one Billy's school did, so that more William Joyces could be unleashed on the world!